This listing is for a BRAND NEW custom - made to order - pair of saddle "Owl Head" designed wood plugs. It took over 3.5 months to carve 50 pair (10 pair, each size listed) to create these plugs. They are 100% handmade and 100% all organic. 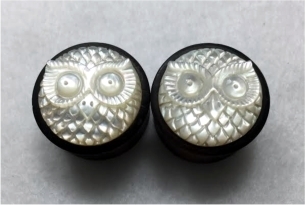 The plugs themselves are made from Black Arang wood and the face of the Owl is made from Mother Of Pearl. These plugs are a very rare find! These plugs are sold in pairs... in other words, you get two (2) of them with your purchase. All of our organic wooden plugs are 100% handmade and 100% all natural.